↑ "Rajinikanth gets Padma Vibhushan; Padma Shri for Priyanka, Ajay Devgn". The Indian Express (New Delhi). 26 January 2014. Archived from the original on 25 October 2016. http://indianexpress.com/article/entertainment/bollywood/rajinikanth-awarded-padma-vibhushan-padma-shri-for-priyanka-chopra-ajay-devgn/. अन्तिम पहुँच तिथि: 8 December 2016. ↑ श्रीनिवासन, मीरा (4 सितम्बर 2010). "फ्यूज़न ऑफ़ कल्चर एट सेलिब्रिटी वेडिंग". द हिन्दू. http://www.hindu.com/2010/09/04/stories/2010090464702000.htm. अन्तिम पहुँच तिथि: 24 जून 2013. ↑ ३.० ३.१ Ethiraj, Gopal (14 दिसम्बर 2009). 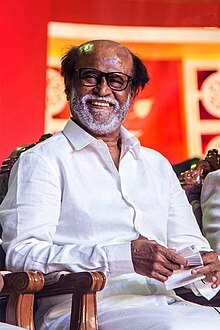 "Sunday Celebrity: Rajini is simple, stylish, spiritual, that explains his uniqueness". Asian Tribune. http://www.asiantribune.com/news/2009/12/14/sunday-celebrity-rajini-simple-stylish-spiritual-explains-his-uniqueness. अन्तिम पहुँच तिथि: 14 दिसम्बर 2009.